CCRTA President represents Calloway County at largest protest in Frankfort in decades. Front (L-R) Gina Crider CCSD, Kim Phelps MCSD, Patricia Murphy MCSD, Claire Harmon MCHS,Dalton York MCHS, and Alec Foust UK student. Middle (L-R) Rhonda Wicker CCSD, Robin Brown MISD and KEA rep, 2 teachers from the upstate. Back (L-R) Marshall Ward Pres. CCRTA and Rob Ryan CCSD. The Grandparent Essay winner picture is attached. 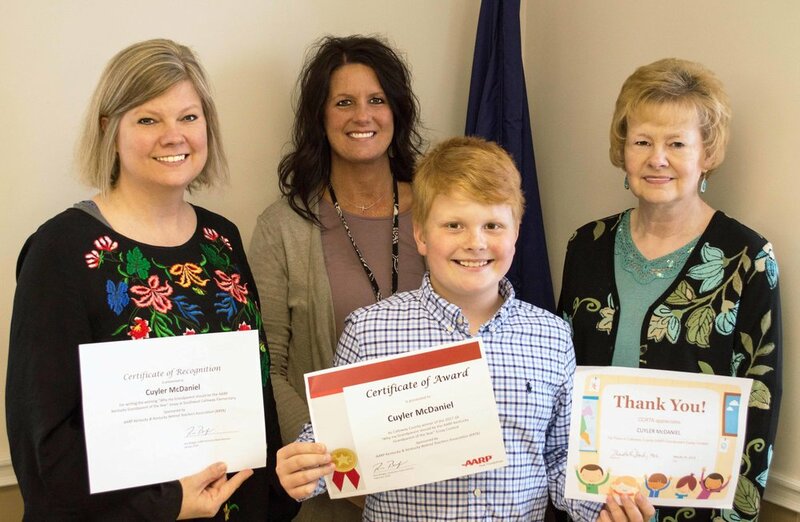 From left to right, the people are: Tammy McDaniel (mother), Kellye Steele (5th grade teacher), Cuyler McDaniel (winner), Joanne Mahan (grandmother).